Microprocessor based ET trip systems. ET6A provides Overload, Short-circuit, Instantaneous and Earth-fault protections with current metering. ET2A provides Overload and Short-circuit protections with current metering. Icu=Ics=Icw(1sec) = 50kA @ 440V AC. All draw-out type circuit breakers will be supplied with:(i) Top and Bottom horizontal terminations. (ii) 1 No. Electrical fault indication Contact (SDE). (iii) 1 No. Auxiliary contact block (OF) with 4 C/O contacts. 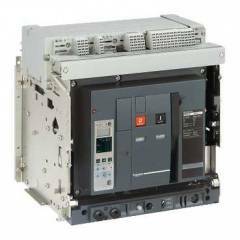 Schneider TP ACB 800A-4000A (ET6A Trip Unit-Manual Type)-MVS12N3MW6A is a premium quality Air Circuit Breaker from Schneider. Moglix is a well-known ecommerce platform for qualitative range of Air Circuit Breaker. All Schneider TP ACB 800A-4000A (ET6A Trip Unit-Manual Type)-MVS12N3MW6A are manufactured by using quality assured material and advanced techniques, which make them up to the standard in this highly challenging field. The materials utilized to manufacture Schneider TP ACB 800A-4000A (ET6A Trip Unit-Manual Type)-MVS12N3MW6A, are sourced from the most reliable and official Air Circuit Breaker vendors, chosen after performing detailed market surveys. Thus, Schneider products are widely acknowledged in the market for their high quality. We are dedicatedly involved in providing an excellent quality array of Schneider Air Circuit Breaker.